It's hard to believe that May is already in the books and the first half of 2018 will soon be over. Time moving forward, whether you want it to or not, is one of the few constants in life. 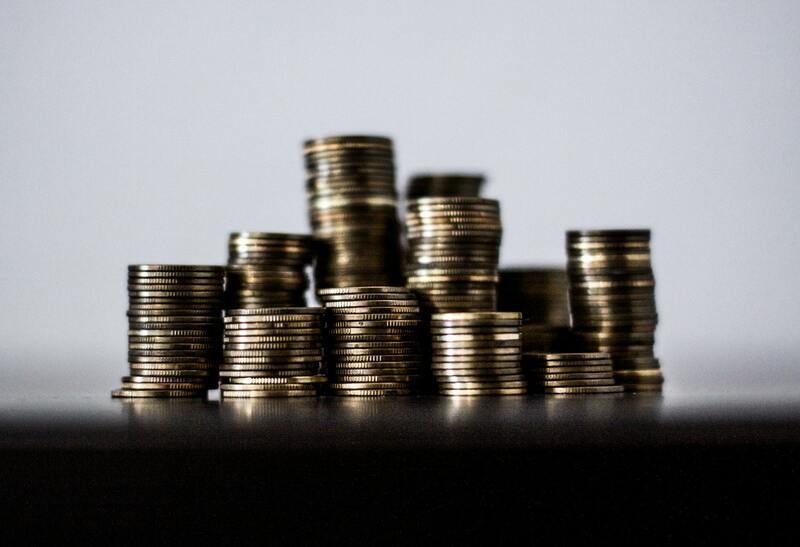 May turned out to be a solid month of dividends, but nothing to get overly excited about. My FI Portfolio produced $288.32 in dividends during the month. My Folio First account chipped in another $4.03. My Roth IRA was absent as per usual for the middle month of each quarter. Combined the 3 portfolios produced $292.35 during May. 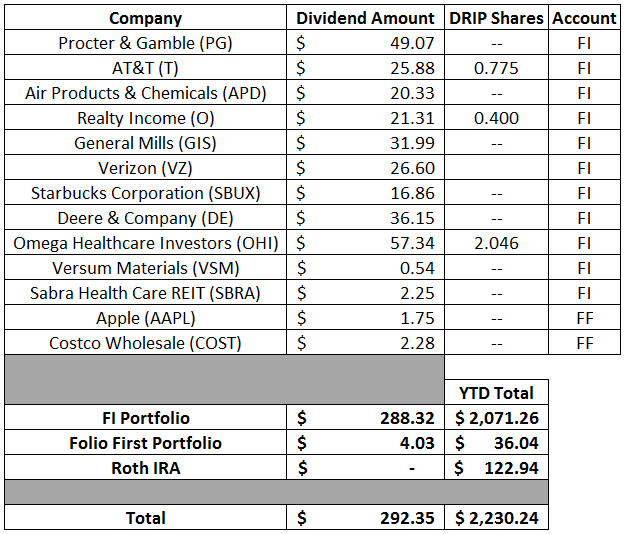 As I mentioned above my FI Portfolio produced $288.32 in dividends last month. The quarter over quarter comparison showed a nice 2.5% increase compared to February of this year. What's really exciting about that though is that that 2.5% bump came entirely from dividend increases and a few dividend re-investments. The year over year comparison gives a better look at growth since most companies maintain the same payout month from year to year. Compared to May 2017 last months dividends showed an underwhelming 3.6% increase year over year. However, on a closer examination that's because YUM Brands (YUM) paid a dividend in May 2017, but has since swapped their payout months and therefore didn't make a payment in May 2018. Adjusting the May 2017 dividends received to reflect that makes the year over year increase climb up to a solid 8.5%. My Roth IRA provided no dividends during May which is the norm as the companies I own all pay in the first or last month of each quarter. The pay raises just keep on coming. May was the slowest month thus far in 2018 for dividend increase announcements with just 3 companies giving me raises. You mean a company I own a piece of, albeit tiny, wants to pay out more of their profits to me just because I own part of the company? Sign me up! While it was the lowest number of increases I've received for a month that's still 3 different pay raises in May alone compared to a big, fat zero from my day job. Combined those 3 companies increased my forward 12-month dividends by $25.37. Through the first 5 months of 2018 there's been 27 announced raises from 26 of the companies that I own combining to increase my forward 12-month dividends by $240.05. My forward 12-month dividends for my FI Portfolio ended March at $6,221.79 while my FolioFirst forward dividends are at $81.97. That brings the total taxable account forward 12-month dividends to $6,303.76 My Roth IRA's forward-12 month dividends remain at at $338.52. Across all 3 accounts, assuming no dividend cuts or position size changes, I can expect to receive at least $6,642.28 in dividends over the next year. The rolling 12-month monthly average for my FI Portfolio is at $484.94 per month which is a solid $11 above 2017's monthly average of $473.37. This should continue to increase throughout the year assuming no dividends cuts. How are you doing on your dividend goals through the first 5 months of 2018? Looks like you haven't made many new purchases during the last 12-month period, so considering that it's a solid y-o-y growth. I have continued making new purchases every month, but I could also leave my portfolio on autopilot and, most likely, it would produce more income year after year. Which is pretty awesome if you ask me. Great month PIP. This is a textbook example of the benefits of dividend growth investing. I love the 8% increase (adjusted) due solely to dividend increases and dividend re-investment. Keep up the great work! I like the comment above. It's so true. "The big money is not in the buying or selling, but in the waiting." Keep up the good work. As long you can show year over yera gains you are headed in the right direction. As usual nice list of companies paying you. Glad to see you back on track. Let the dividend snowball keep rolling! Congrats on another solid month PIP. Even though it was a small increase compared to last year, it's still moving in the right direction and you're still benefiting from passive income growth!